Description: ST 621(SD-26) bad paint!! 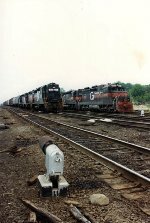 Description: A power set you could see only in Binghamton, a SOO SD leads and ex Santa Fe SD26 past BD with inbound train 270 from Buffalo. 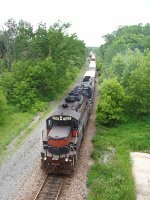 The train has come in on the Johnson Runner, at one time the DLW westbound main track, from CP Johnson. Description: ST 621 leading a train west at the Willows. Title: "An ancient pair still earning their keep"
Description: ST 621 and 643 idling the afternoon away at Rigby Yard. Santa Fe originally had 80 of these units, and 35 of them were sold to Guilford. These two are the only ones left in existance that are still in operation. Description: ST 621 at Rigby Yard. One of only two operating SD26s still in existance. 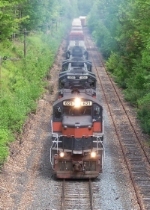 Description: Guilford train EDRJ about to enter the Hoosac Tunnel. Note what is left of the old catenary system, from the days when electric locomotives would haul steam trains through the tunnel. Description: Westbound at River Rd.